A view of the 2018 Wooden Boat Festival of Geelong, onshore with some of the couta boats in the foreground. Image: David Payne/ANMM. 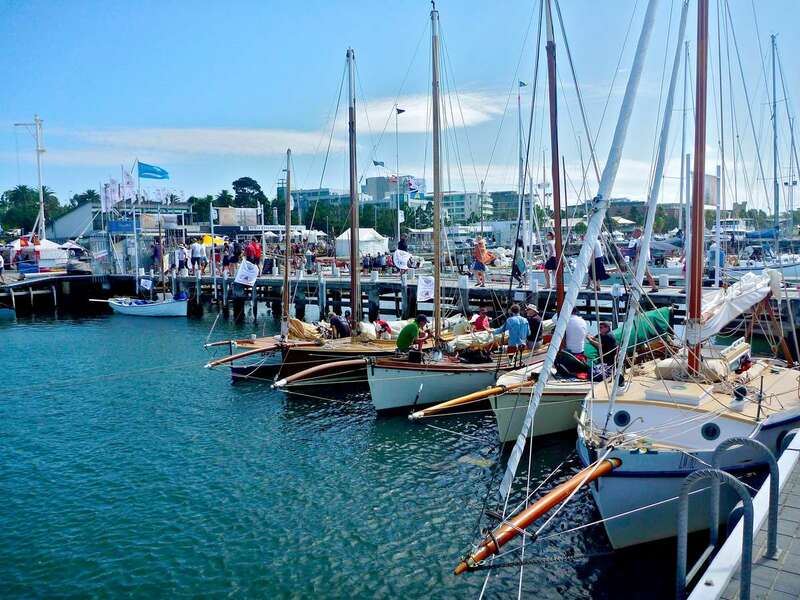 The 9th Wooden Boat Festival of Geelong was held over the Victorian long weekend in mid-March, and it was another very successful event, drawing a big crowd over the three days. It was managed by the Royal Geelong Yacht Club and the GWBF committee, and featured a wide range of activities and displays on and off the water. Geelong is at the end of Corio Bay in the south west of Port Phillip. It has been a strong regional city and the yacht club has held, state, national and world championships over many years. This was the second WBFG that I have attended representing, the museum and the Australian Register of Historic Vessels. Since my previous visit in 2010, the event has grown with the same successful format was in place, combining on and off water activities and displays. The Ernest Digby designed and built 8 metre class Frances sailing past the breakwater. Image: David Payne/ANMM. 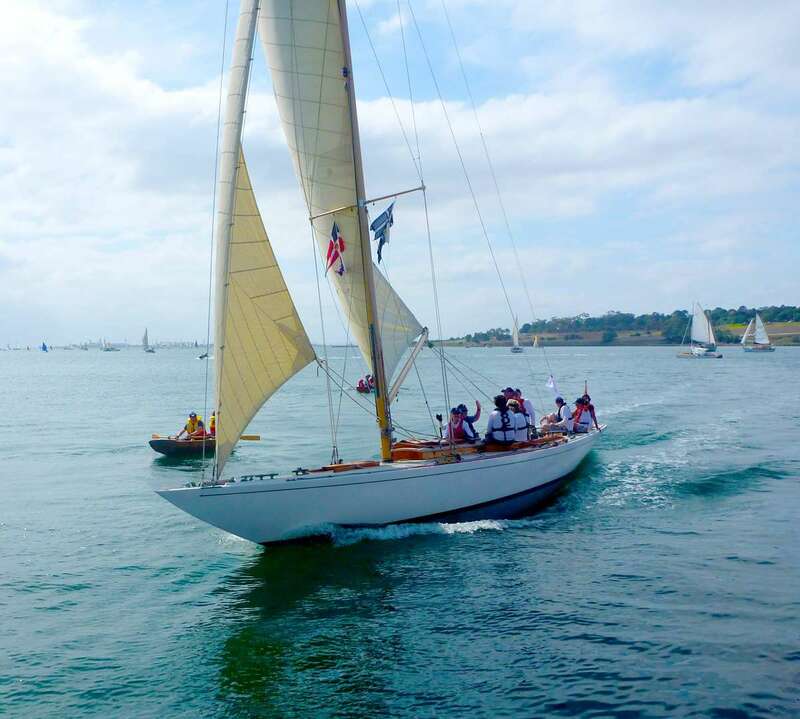 A number of the yachts and boats came down to Geelong via the feeder race, this time it began in Port Arlington, and they arrived later on Saturday at Geelong. Sunday featured an exciting sail past. The fleet assembles to the northeast and then forms a line of craft sailing, motoring or paddling by the breakwater at the end of the clubs large marina. There seems to be an unofficial ‘competition’ to try and sail as close as you are allowed to, and it’s a great sight for the spectators as the large yachts pass within 50 metres of where the crowds are lined up. Other on water activities are going on throughout the event. In 2010 there were couta boats racing a section of their state championships, this time it was the Cadet dinghies with their youth age group sailors out there, with three heats each day. 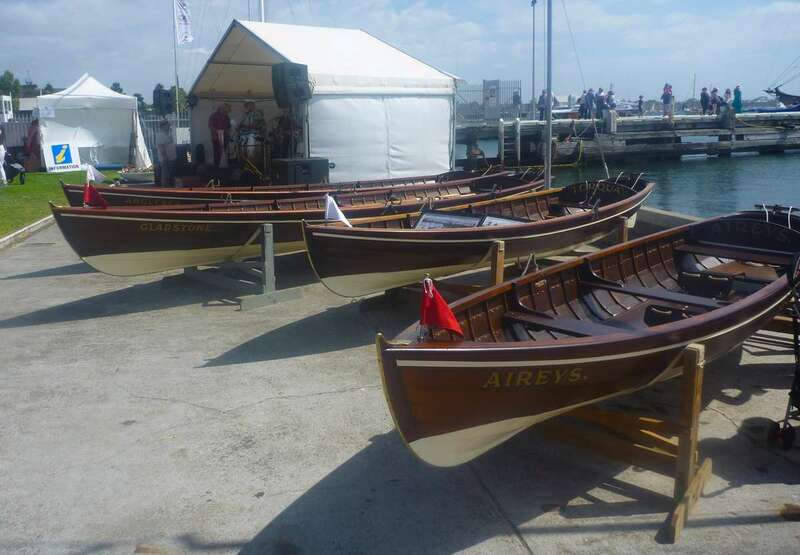 The historical skiffs from Sydney were represented by three of their craft, Yendys, Australia and Britannia who gave a demonstration race each day. The tall ships Coral Trekker and Enterprise were in and out with passengers doing short trips, plus we had an annual rowing event from a pair of the Anglesea Sports and Recreation Club craft. The four Anglesea rowing skiffs, Torquay, Anglesea, Gladstone and Aireys. Image: David Payne/ANMM. On shore, the Quick ‘n Dirty boat building competition was on, with some curious ideas of vessel design being made for the race…and the inevitable capsize. Trade stalls were set up on the forecourt, static displays of power craft and rowing or paddling vessels were out in the hardstand, the local historic car club had a range of MGs and other cars beside the club, there was some wonderful entertainment and food provided by the Vietnamese community, along with other music and singing groups. 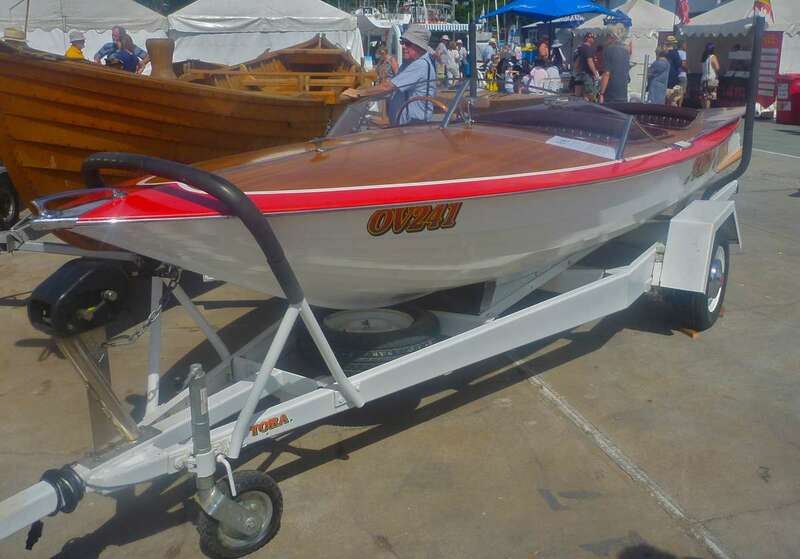 Tora Tora, a locally built clinker ski boat in immaculate condition. Image: David Payne/ANMM. In the theatre, a series of presentations and talks went on over two days, and I gave a presentation on the ARHV and the website. Later, at the official dinner, I handed out ARHV certificates to a number of the vessels that were there and had been nominated. Amongst these were the four Anglesea craft – the yachts Sayonara, Boambillie, Bungoona, Frances – and many more. Helped by good weather, the whole festival went off smoothly, and the waterfront was the place to be in Geelong. In April, from the 13th to the 15th the place to be will be here at the museum for our Classic and Wooden Boat Festival, where you will see many more wonderful heritage and current classic vessels, and onshore displays.